Chennai metropolis has been growing rapidly and traffic volumes on the road have increased enormously. Need was felt of an underground rail-based system which can integrate with the existing transport systems, both rail and road. Two routes were planned, Corridor I of 23 km starting from Washermanpet to airport, out of which 14.3 km would be underground. Corridor II of 22 km starting from Chennai Central Railway station to St. Thomas mount, out of which 9.7 km would be underground. 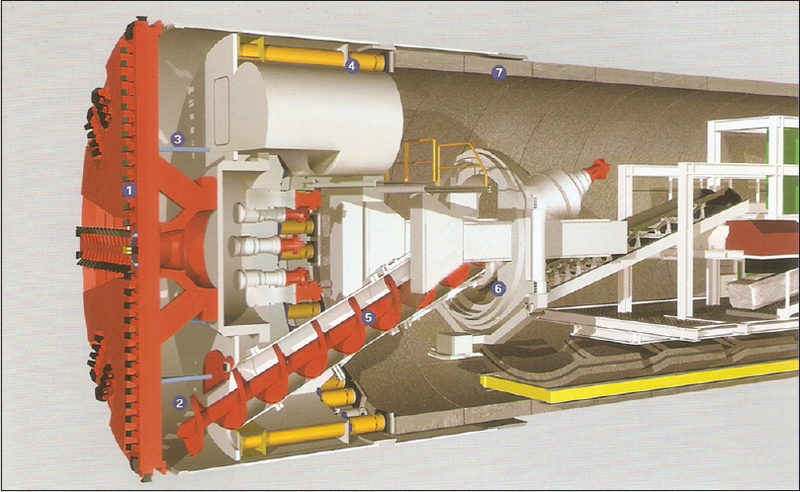 Tunnel boring machines (TBM) are used for constructing tunnels. These are large machines of 6–7 M and more in diameter with cutting tools fitted on their advancing face. Cutting face rotates at 2–3 rpm crushing earth and rock. This produces considerable heat due to friction. Bentonite mixed with water is used continuously to lubricate cutting tools. When water is mixed with bentonite, it produces an exothermic reaction producing heat, further increasing temperature in the excavation chamber. Temperature of the excavated material coming out from the screw conveyor is often above 65°C. Depending on the wear and tear, the cutting tools need to be inspected and replaced manually. Temperature in the excavation chamber is well above the ambient temperature and comfort zone when work is undertaken. When ground water is present, its ingress is prevented by pressurizing the area with compressed air. Miners have to work under increased atmospheric pressure. Length of time a miner can work under pressure is stipulated by the pneumatic pressure in the excavation chamber. It can be 8.5 hours at 1 bar reducing to 4.5 hours at 3.5 bar pressure. Time spent under pressure is followed by a long decompression time. During a five-year period from 2012 to 2017, more than 45,000 man hours of work under compressed air was carried out. National Health Policy (2002) has highlighted the fact that the “work conditions in several sectors of employment in the country are substandard. As a result, workers engaged in such employment become particularly vulnerable to occupation linked ailment.” Concern for safety is in most cases brushed under the carpet as the safety implantation is expensive. Safety improvement initiative gets implemented only when forced to do so by the client. There is an urgent need to update the Indian Standard 4138-1977: Safety Code for Working in Compressed Air, which can be enforced legally and bring it on par with modern tunneling methods. A working group of British Tunneling Society and International Tunneling Underground Space Association have produced a number of guiding documents for compressed air work which should be used to formulate a policy of safe working practices at every site. All these points suggest that these workers were at higher risk of health illness if proper guidelines and regulations are not followed. Hence, the present study focuses on risk assessment at the working site. To evaluate heat stress during hyperbaric intervention on TBM in tunnel construction site of Metro Rail in Chennai. Study design: Hyperbaric intervention is carried out when inspection and replacement of cutting tools is required. Once started, work continues round the clock till completion, which might be a few days. Mining commences as soon as intervention stops. During intervention, all other construction work in the tunnel is stopped. Effect of heat is, thus, faced by the miners working in the excavation chamber only. Forced ventilation is available for the support staff located in the area behind the TBM in the tunnel. Sample size: A total of 188 miners, including supervisors, were declared fit to work in compressed air. Compressed air work (CAW) on the Chennai Metro Rail Project continued for 5 years from 2012 to 2017. Twelve TBMs were used [Figure 1]. More than 45,000 man hours of work was carried out under compressed air pressure ranging from 1.2 to 1.9 bar. Temperature in the excavation chamber was measured when the steel door separating the excavation chamber from man lock was opened, and was measured each hour when miners were working in the excavation chamber. Intervention often lasted for days and temperature recorded at the beginning of the work was the highest and tapered over a few hours and the maintained at that level. Equipment used is an expansion temperature gauge (Barigo, Germany) supplied by the TBM manufacturer. Temperature was recorded between 32 and 42°C. Maximum temperature recorded before start of work was 52°C well into the dangerous level. Although ice was placed in man locks, there was always hurry on the part of management to start work and replace worn out equipment to commence mining operations for commercial reasons. Changing cutting tools is an extremely tiring work carried out in a cramped space. [Figure 2] A single cutting disc weighs approximately 80 kg and a double disc weighs 180 kg. Without pneumatic equipment, it is very difficult to remove the nuts and bolts fastening the cutting tools. Welding (gouging) may also be required, which requires additional safety measures. Compressed air required for maintaining pressure in man locks is supplied from a series of reservoirs of 10 M 3 located outside the tunnel. Storage pressure is 6–7 bar. Pressure at the man lock is controlled to 3 bar. 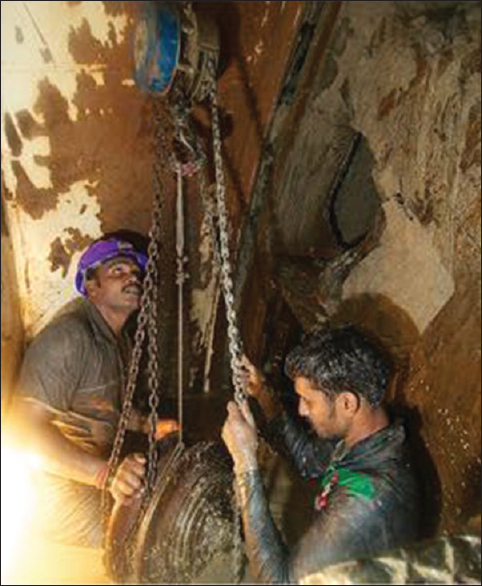 Man locks were operated by experienced operators who had worked earlier in the commercial diving industry. When compression of miners commences, temperature in the man locks increases further, as per the gas laws. Exhaust valves on the man locks were kept partially open all the time and maintaining pressure by opening the pressurization valve. This high rate of ventilation (air movement) increases heat loss from the skin (body) of the miners. However, the air supplied was at surface temperature which in Chennai was about 30°C and above. If chilled air were to be supplied, comfort level of miners would have been higher, in turn, resulting in better productivity. Normally, three people work in a shift, two inside the excavation chamber and the third manning communication and safety member. He would relieve one of the miners as required. Instead four miners in two pairs were used per shift, one pair to work inside the excavation chamber for half hour to be relieved by the second pair before fatigue could set in. Adequate rehydration and rest could be achieved under pressure. This resulted in higher productivity. Man lock operators were alert for any miner showing signs of severe fatigue, nausea, light headedness, or dizziness. Such persons were immediately decompressed and attended to. Rehydration was done using ORS. Fruits and “ground nut jaggery sweet (chikki)” ensured high-calorie nutrition. During decompression, which involves large periods of inactivity, snacks were provided. Man locks are provided with a sprinkler system for firefighting. Miners were encouraged to use this as a “shower” to cool the body. Thirty-five years was the upper age for new entrants. All miners were medically examined which consisted of X-ray chest, resting ECG, pulmonary function test, audiometry, complete blood count, blood sugar, and lipid profile. Persons with forced vital capacity <3l and those with evidence of bronchial obstruction, i.e. FEV1/FVC <80% were rejected. Those with BMI > 3> were rejected. In short, persons with above average fitness level were selected as miners. All persons declared fit were subjected to a pressure test, i.e. they were pressurized in a compression chamber to 1.8 bar and were decompressed thereafter. This was to ascertain their ability to equalize middle ear pressure and ability to carry out a Valsalva maneuver. This also familiarized persons to work in confined spaces. All miners before pressurization in the air locks were examined by a medical attendant, and those with evidence of upper respiratory infection/middle ear infection were debarred from working for the day as this would interfere with middle ear pressure equalization. Inability to carry out a Valsalva maneuver was a reason for unfitness for the day, incompatible with work in compressed air. Pulse and blood pressure were recorded. Tachycardia was a cause of rejection for the day. Similarly, those with evidence of recent alcohol consumption were rejected. Monitoring temperature, while working, whether skin or core was not possible as the medical attendant would then be required to be pressurized to enter the working chamber. He was required to do so in case of an emergency only. After working for 4 hours at 1.5 bar pressure, miners were required to undergo depressurization for over an hour. During depressurization, the temperature in man lock reduces as per the gas laws, which was followed by a hold period for a few minutes. Consequently, miners were well rested and rehydrated on depressurization. Post decompression medical consisted of monitoring pulse to detect arrhythmias and asking for symptoms, if any. Core body temperature monitoring after depressurization using rectal thermometer was not done as being impractical without symptoms and a life-threatening condition. Tympanic membrane temperature monitoring equipment was not available in the occupational health centre. On a few occasions, the heat coming out of the excavation chamber was so intense that miners could not enter to record the temperature and the work was abandoned. Temperature above 50°C was recorded on 20 occasions. Five hundred kilogram of ice in 25 kg blocks was placed inside the excavation chamber to reduce the temperature. Melting ice accelerated the exothermic reaction of bentonite as well as the humidity. In a majority of cases, work was carried out in the temperature range of 34–45°C. Daily temperature range was recorded and percentage was recorded [Table 1]. A total of 188 miners were declared fit to work in compressed air. Summary of lung function tests done is presented in [Table 2]. Heat disorders among the obese and overweight occur more frequently than in lean individuals. Average BMI was 24.26 with a standard deviation of 3.06. Strict medical selection criteria eliminated obese and overweight individuals. Exposure to extreme heat can result in occupational illnesses caused by heat stress, including heat stroke, heat exhaustion, heat syncope, heat cramps, heat rashes, or death. Sweaty palms, fogged safety glasses, and dizziness may reduce rational thinking and predisposes workers to injuries. Other heat injuries, such as burns, may occur as a result of contact with hot surfaces. Occupational exposure to heat can result in injuries, disease, reduced productivity, and death. Total heat stress is considered to be the sum of the heat generated in the body (metabolic heat) plus the heat gained from the environment minus the heat lost from the body to environment. This results in a physiological response called heat strain to promote transfer of heat from body back to the environment to maintain the core body temperature at 37°C. Level of heat stress at which excessive heat strain will result depends on the heat tolerance capabilities of the worker, which in turn depends on his physical fitness, age, level of acclimatization. There is a wide range of heat tolerance between workers, however, every individual has an upper limit for heat stress, beyond which the worker can become a casualty. Long distance runners or football players are known to tolerate an increased body core temperature at 39°C due to excellent aerobic fitness levels and acclimatization. An essential requirement for continued normal body function is that the deep body core temperature be maintained within the range of about 37°C ± 1°C. Achieving this body temperature equilibrium requires a constant exchange of heat between the body and the environment. The rate and mount of the heat exchange are governed by the fundamental laws of thermodynamics of heat exchange between objects. The amount of heat that must be exchanged is a function of (a) the total heat produced by the body (metabolic heat), which typically range from about 1 kcal.kg−1 of body weight.h−1 (1.16 W) at rest to 5 kcal.kg−1 body weight.h−1 (7 W) for moderately hard industrial work, and (b) the heat gained, if any, from the environment. The rate of heat exchange with the environment is a function of air temperature and humidity, skin temperature, air velocity, evaporation of sweat, radiant temperature, and type, amount, and characteristics of the clothing worn. Respiratory heat loss is generally of minor consequence except during hard work in very dry environments. The heat produced by the muscles during exercise can be much higher and must be dissipated if a heat balance is to be maintained. The heat load from metabolism is, therefore, widely variable, and working in hot environments (which imposes its own heat load restricts heat dissipation) poses the greatest challenge to normal thermoregulation. The proportion of maximal aerobic capacity (VO2 max) needed to do a specific job is important for several reasons. First, the cardiovascular system must respond with an increased cardiac output which at levels of work up to about 40% VO2 max is brought about by an increase in both stroke volume and heart rate. When maximum stroke volume is reached, additional increases in cardiac output can be achieved solely by increased heart rate until maximal heart rate is reached., These changes in the cardiovascular response to exercise are responsible for providing sufficient blood flow to muscular work. Further complexities arise when high work intensities are sustained for long periods, particularly when work is carried out in hot surrounding. Second, muscular activity is associated with an increase in muscle temperature, which is associated with increase in core temperature, with attendant influence on the thermoregulatory controls. Third, at high levels of exercise, even in a temperature environment, oxygen supply to the tissues may be insufficient to completely meet the oxygen needs of the working muscles. In a compressed air environment, partial pressure of oxygen in air is higher and oxygen insufficiency will not occur. In warmer conditions, an adequate supply of oxygen to the tissue may become a problem even at moderate work intensities because of competition for blood distribution between the working muscle and the skin. Because of the lack of oxygen, the working muscle must begin to draw on their anerobic reserves, deriving energy from the oxidation of glycogen in the muscles. This leads to the accumulation of lactic acid, which may be associated with the development of muscular fatigue. All persons working in compressed air were highly motivated to work against all odds. They were given a “pressure allowance” for every hour spent under pressure, which was the main motivational factor for the miners to volunteer for the work. Once decompression was over, miners had to be given very light job till the end of the usual 12-hour shift or were simply allowed to go home. Snacks and food provided while working was yet another motivational factor. Pressure allowance, reduced working hours, and food played a major role in motivation. Monetary incentives depending upon time spent under pressure till commencement of decompression. British Tunneling Society Compressed Air Working Group. A Guide to the Work in Compressed air Regulations; 1996. Guidelines for Good Working Practice in High Pressure Compressed Air, ITA Working Group No. 5. Ch. 1015. Lausanne: International Tunneling Association; 2010. Chung NK, Pin CH. Obesity and the occurrence of heat disorders. Mil Med 1996;161:739-42. Jacklitsch B, willams WJ, Musolin K, Coca A, Kim J - H, Turner N Cincinnati, OH : US department of Health and Human Services, Centers for Disease Control and prevention, National Institute for Occupational Safety and Health, DHHS (NIOSH) publication 2016 - 106. Parsons KC. Human Thermal Environments: The Effects of Hot, Moderate, and Cold Environments on Human Health, Comfort, and Performance. 2nd ed. London: Taylor and Francis; 2003. McArdle WD, Katch FI, Katch VI. Exercise Physiology. 4th ed. Baltimore: Williams and Wilkins; 1996b. Taylor NA, Kondo N, Kenny WL. The physiology of acute heat exposure, with implications for human performance in the heat. In: Taylor NA, Groeller H, editors. Physiological Bases of Human Performance During Work and Exercise. 1st ed. Edinburgh: Elsevier; 2008. Åstrand PO, Rodahl K, Dahl HA, Strømme SB. Textbook of Work Physiology. Champaign, IL: Human Kinetics; 2003. Rowell LR. Human Cardiovascular Control. New York: Oxford University Press; 1993.